BlingSoul New Doctor Strange Costume Cosplay Jewelry - Eye of Agamotto Necklace (Large) by BlingSoul at The Black Pearl. Hurry! Limited time offer. Offer valid only while supplies last. Set your rules in the world of fashion and amaze all the masses around you by attiring this colorful and attractive Eye of Agamotto pendant necklace. Set your rules in the world of fashion and amaze all the masses around you by attiring this colorful and attractive Eye of Agamotto pendant necklace. This elegant necklace has been inspired by the famous character which can be used as necklet also. The Eye of Agamotto infinity stone necklace is a very important relic that can be quite dangerous if used in the wrong hands, it can sort of manipulate probabilities which are the part of doctor strange the Eye of Agamotto story. All those who are seeking for an inspirational necklace with the exact look, then this is what you need. This eye-catching Doctor Strange amulet is designed very creatively and artistically by our master designers. 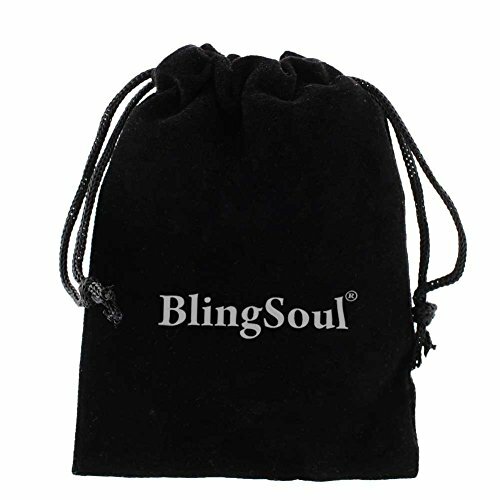 ✔ The strap of this elegant strange necklaces has been crafted using the premier quality of leather to offer you high durability and long lasting for years. 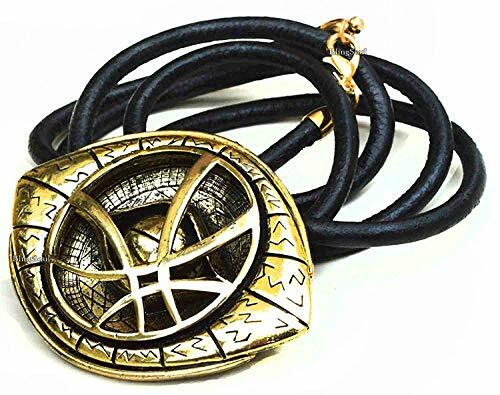 ✔ Our professional designers have created this Screen Accurate eye of Agamotto dr strange necklace just to offer you the exact thing which you are looking for, you can also use this beautiful strange necklace as a display item. ✔ It has been built using high quality of alloy material to provide richness and lavishness to your eye of Agamotto marvel necklace. 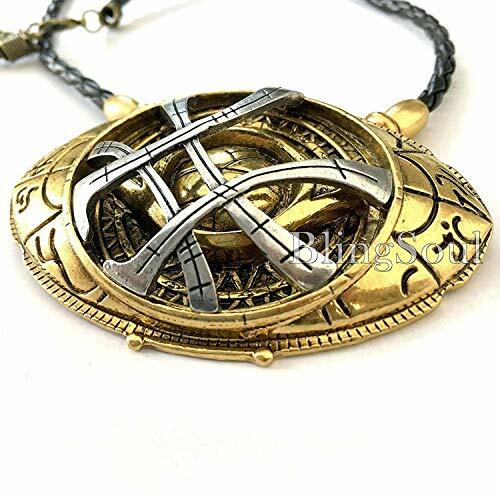 ✔ You can wear this nicely constructed Doctor strange necklace to any of your gatherings to make your impression very impressive at the very first glance. ✔ If you are playing doctor character than you can carry this marvel eye of Agamotto necklace to Halloween party for the more striking look. 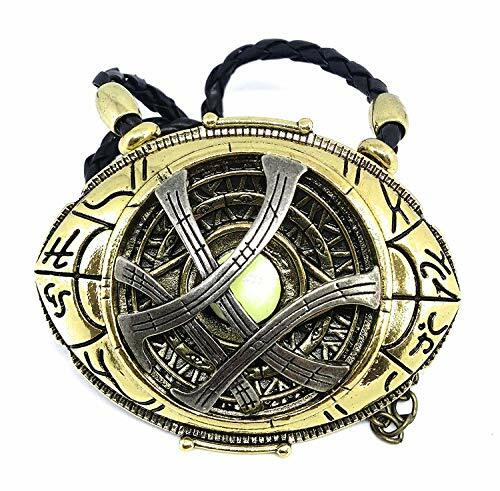 ✔ Our specialist's craftsmen have used top quality of alloy to make you feel comfortable eye of Agamotto time stone necklace. ✔ If you are a doctor strange fan or collector and if you really wanted to take your fandom further, there's no doubt that this is the Eye you want! ✔ This Doctor Strange amulet is 10cm (3 inches) wide and 5cm (2 inches) high. The leather cord is 70cm (28 inches) long with 5cm extendable fastening. Adjustable and comfortable Eye of Agamotto prop. This is a very nice item for cosplay of collection. Its solid, made out of cast metal & feels very durable. 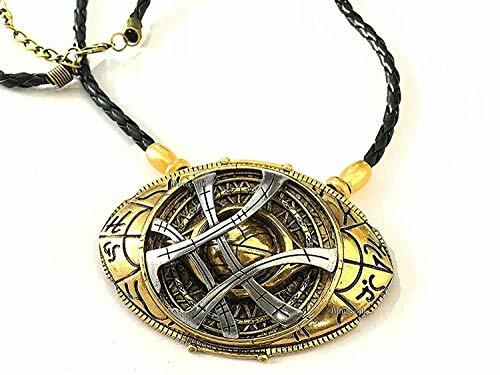 ✔ The weight and composite of doctor strange necklace merchandise make this a good buy, for someone looking for movie prop or cosplay costume authenticate experience. ✔ Amazing detail and construction. The Eye of Agamotto Infinity Stone necklace jewellery is very sturdy. It has very accurate etchings, symbols, and even the "flash" around the outside edges is a perfect match. It looks exactly like in the movie. Right color, same pattern. Excellent product. Great detail and sturdy metal.